Ah, the life of a surfer. Some days, you struggle to stand up on your board and end up face-planting into the water. Other days, a pod of dolphins ride the waves for you and take your breath away. 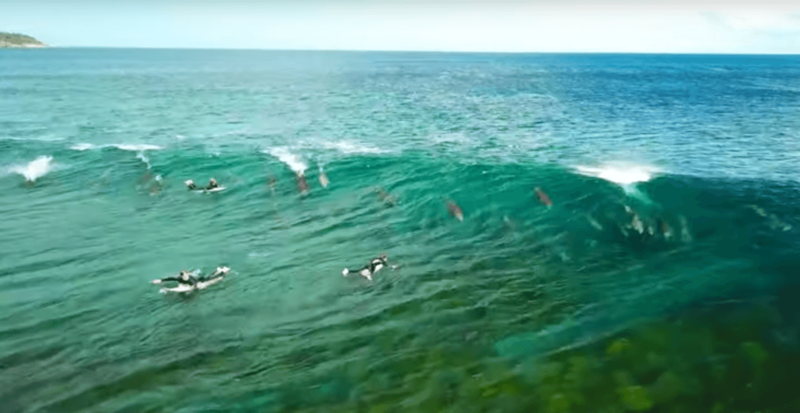 A group of surfers was met with an incredible show during a surf sesh in Australia, when a pod of dolphins rushed underneath the boards and gracefully rode the waves towards the shore. The show was caught on camera by surfer Shaun Petersen of the Dolphin Swim School in New South Wales, and shared to his Instagram account on April 3. The post has generated almost 165,000 views and counting. Following their ride, the dolphins continued zooming through their underwater world to proceed with living their best dolphin lives. These magnificent creatures are an example of the precious wildlife that we share our planet with, and this National Wildlife Week we are shining light on some of the world’s amazing species and what we can do to protect them. Watch the dolphins put on the show on Shaun’s Instagram post below. Dolphin dropins! ・・・ ‘It was a sunny autumn April 2019 day at a beautiful surf break where a pod of dolphins showed up to give the handfull of surfers in the water a show of their dolphin surfing skills! And what a show they did put on!’ One of my most fav captures to date! The 4K full frame is amazing!